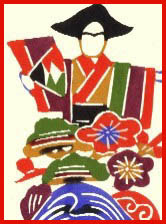 Kōnosu earned the nickname "Doll Town" for its many "Hina Ningyo" (a type of Japanese doll) factories. Kōnosu is also called "Flower town." It has several flower markets, and many flowers purchased in Tokyo and Kantō region are grown in Kōnosu. The most popular flower in the city is the pansy, which is also the city's official flower. 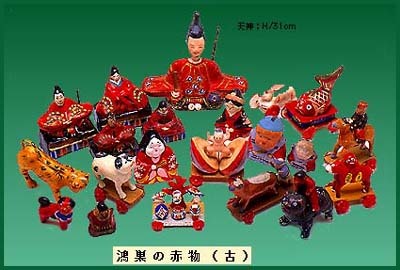 In Konosu, dolls are produced one by one by the hands of skilled craftsmen. 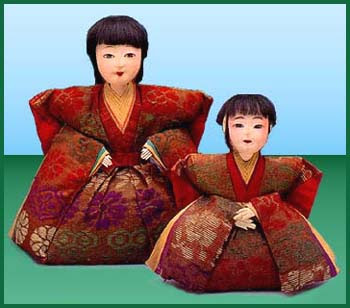 Such Japanese traditional culture as doll manufacturing and associated sense of beauty spread to other parts of Japan, and is handed down through the generations. 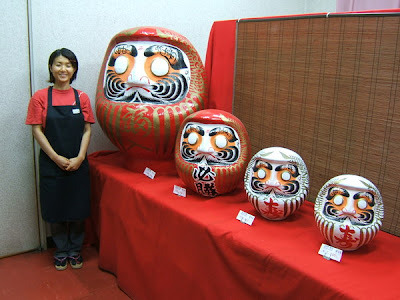 Here is a collection with one BIG Daruma! A whole group of them ! They ward off smallpox and other diseases of children. Also to ward off evil generally. Some are made quite simple. 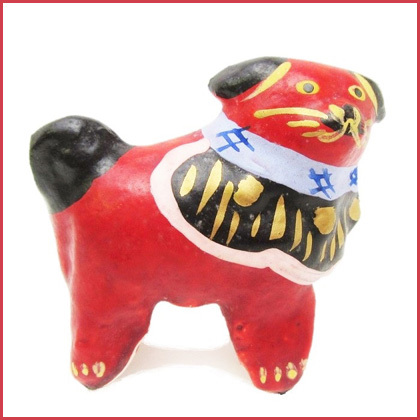 Kintoki is the local name for Kintaro, the Strong Boy. 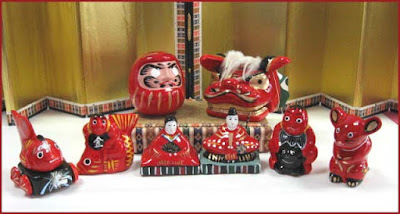 His toys are bought with the wish for a strong and healthy child.
. Kintaro and Daruma だるま抱き金太郎 . 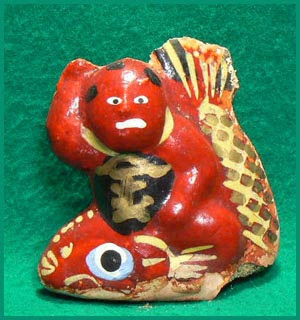 The God of Diseases is invited to sit on this red fish and swim away in the nearest river. 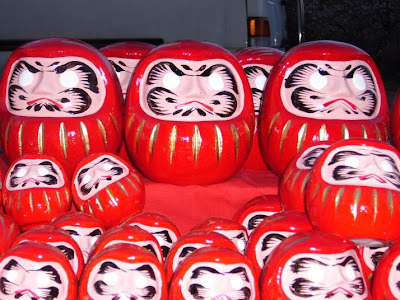 These "red things" are an important cultural property of Japan. The Akamono dolls are sold along the access road to 伏見稲荷 Fushimi Inari shrine.
. akamono komusoo 虚無僧 Komuso begging monk .
. akamono rikishi　赤もの力士 Sumo wrestler .
. akamono Saigyo 西行童子 as a child .
. akamono 三味線弾き shamisen player .
. akamono Tenjin 天神さま Sugawara Michizane . 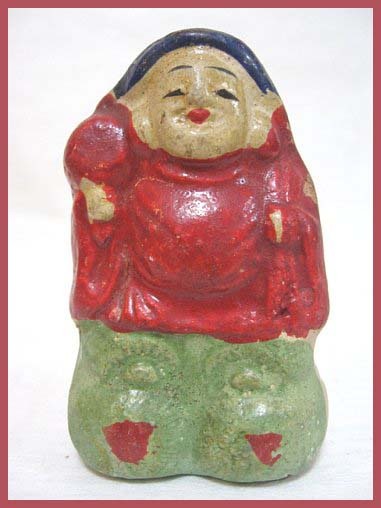 made with clay or raw natural glue and chips of paulownia, leftover from woodcarving of furniture and other dolls. This paste is pressed into molds and later colored. 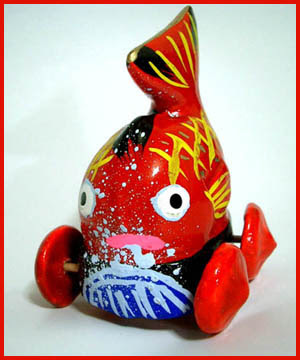 Together with the nerimono from Iwatsuki in Saitama, they are the most popular "seasonal dolls" in Kanto. 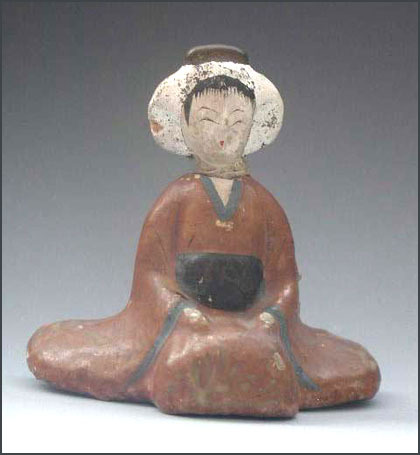 The tradition goes back to the clay dolls of Fushimi, Kyoto, and have been handed down in the Sekiguchi family 関口家, in the store Yoshimiya 吉見屋, since about 1580. 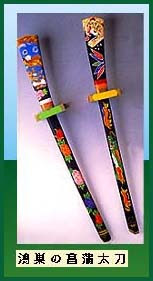 The akamono are the most popular among the nerimono. 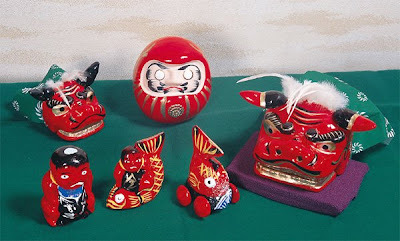 They come in traditional forms (above) and some more modern ones.
. inu 戌 /　犬 Dog dolls and toys .
. Kagawa nerimono 練り物 by Oosaki Toyogoroo 大崎豊五郎 .
. Kanazawa no nerimono　金沢の練り物 hand-twisted toys .
. Ise no nerimono 伊勢の練り物 twisted clay dolls from Ise Shrine .
. 練人形 Kamo Matsubara neri-ningyo dolls . For the Boy's Festival on May 5. 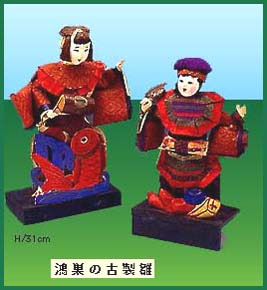 They are made from wood and can be up to 1 meter long.
. Musha ningyoo 武者人形 Samurai Dolls .
. Tenjin sama - INTRODUCTION . Thank you for the excellent link. 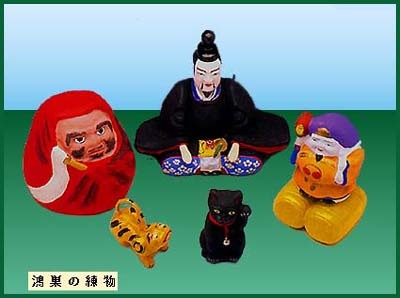 We love Japanese Hina Ningyo and have a large set. Our trip is back on and we are set to return to Japan in April of next year. Pray that all goes well.